The MHWE300VW is part of the Performance Series Front Load washing machines offered by Maytag. A load capacity of 4.1 cubic feet means that this washer can help save more time, effort, and money by running fewer but larger loads, instead of running numerous small loads. 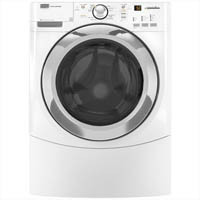 This washer has numerous features and technologies that help make life easier for users. As a front-loading washer, this machine takes advantage of gravity to make efficient use of water and energy. The Maytag MHWE300VW features Sensi-Care and Smart Dispenser systems to ensure that garments will get an optimal wash while still being gentle and sensitive on clothes. The Maytag MHWE300VW has a number of sensors to keep track of the load type, water level, detergent and suds levels, temperature level, and load composition. The information collected from these sensors are then processed by the machine to make automatic adjustments to the water level and temperature. Not only does this help consumers by taking care of the tedious task of guessing what temperature and water level to set, but it also helps achieve an optimal wash cycle while conserving water by using just the right amount. Sensi-Care Wash System ensures that 100% of the water to be used in the washing is well mixed with the laundry products. Only after the water and laundry products are mixed will the machine gently spray the mixed water from the top of the washer into the center of the load. Throughout the cycle, the Smart Dispenser System slowly distributes any bleach, detergent, or fabric softener in the the dispenser compartments. Clothes will get the best possible wash with the efficient use of water and laundry products. This washer can heat up water to 157 degrees Fahrenheit to create steam that helps clean clothes well. The steam can take out sudden stains, kill bacteria, and remove dust mites from the garments. Steam is also used in the Clean Washer Cycle, which is an automated system used to clean the drum and the inside of the washer. The Maytag MHWE300 uses two sensors to monitor the load size and the weight distribution of the load. With the information gathered from the Dynamic Off-Balance Detection sensors, the washer adjusts the six-spring Smooth Balance System to decrease the movement, vibration, and noise produced by the washer. As a Performance Series washer, the MHWE300VW is made with Maytag Commercial Technology and commercial grade parts. This means that consumers can enjoy a durable, sturdy, and long-lasting build that is tough enough to handle commercial use. The washer practically takes care of itself with all of the automated processes. After inputting the options and cycle settings with the easy to use electronic control panel and dial, there's not much to worry about. Consumers can just let it do its own thing and come back when the cycle is through. As a front-loading washer with 4.1 cubic feet of capacity and numerous features for conserving water and energy, the Maytag MHWE300 is a highly efficient washing machine. Although consumers have to spend a little when they first buy this washer, they can make up for what they spent from the savings they have on water and electric bills. With numerous settings and options to choose from, consumers can get the perfect wash for any type of garment or load size. Some complain that the washer does not wash very well and that clothes may have an odor when they come out of the washer. However, this can easily be remedied with a little tinkering around with the controls. What's more, the steam cycles can take quite long to finish at over two hours per cycle. The price tag is also a bit hefty. Its price can be rather discouraging, but consumers have to take into consideration how much they can save on their bills by using this high capacity, front-loading machine. Maytag is now soley owned by Whirlpool, and has been for some time. The days of the lonely Maytag repairman are long gone. Maytag are now just rebadged 'Whirlpools' perhaps with some additional features. I purchased my Maytag 4000 series front load washer 13 months ago. Several weeks ago I starting hearing a very loud sound when my washer was in the spin cycle. I contacted Maytag and because my warranty expired at 12 months, I had to contact Lowes because thankfully I had taken out an extended warranty. A service tech came out and said the bearings were bad and this has been over two weeks ago. Parts are on back order with no estimated time of delivery. I am supposed to be getting a gift card to purchase a new washer. I am very disappointed in Maytag. I thought their products were better than this. I will never buy a Maytag product again. Front loading washer stopped working after 2 months. Service repair man came out and said water got inside and there was calcium buildup near the sensors, and that warranty would not cover it because more than likely it was due to basement flooding. We had a little water in the basement, but not enough to consider it a flood, and it surely did not reach the washer. $500.00 dollars down the drain. I will buy different brand from now on. Anything has to be better than Maytag. The dissapointing thing is that we purcased Maytag because I remembered all the old commercials where the Maytag repair man was the loneliest guy on Earth because the machines never broke down. Maytag has sunk to the bottom since those days. If 0 stars was an option, I would have chose it instead of having to choose 1!! I bought my washer just over a year ago, at the time of purchase I had read reviews and the only issue was that it was somewhat louder than most front loaders. Well now that I have purchased it, problems continue to happen! First off it started reading suds everytime I washed a load. So I decided to wash a load with no detergent, it still read SUDS! About a week later, it started reading F21 which means there is a kink or clog in the hose, except there was NO kink or clog in the hose! Also, EVERY SINGLE LOAD I wash come out totally knotted up so I have to pull the whole load out and un knot them to put them in the drier! After reading these reviews now a year later I am LIVID about my purchase! The worst part is I bought it from Lowe's and I work for Lowe's! (not a good situation)! If ANYONE thinks about buying this model FORGET IT!! It is a total POS!!! Maytag are now solely owned by Whirlpool, the days of the ‘Lonely Maytag Repairman’ have long gone. As far as I am aware ‘Maytags’ are just re-badged Whirlpools. This website very often quotes the lowest prices but often makes up for it with S&H charges. Additionally to them ‘In Stock’ does not mean that they actually have the part(s) just that they may be able to obtain them. In addition to this they will charge your, i.e. debit the credit card you give them as soon as they receive your order regardless of the actual availability of the parts. The part number, 280232, does show as the rear half of the outer drum for a Maytag machine but I would suggest you verify that it is suitable for your model..
Whirlpool/Maytag do not supply the bearings and seal alone but once you get the machine apart you may be able to get a match for the seal and bearings. "what's inside matters" but they don't practice it! The part number for the Rear Bearing is 280232 according to repair man I used on 6/6/11 thru the Consumers Energy Appliance Repair Plan. I was told that the part is not covered & cost is $600. I called Whirlpool/Maytag customer service(800)253-1301 who told me that they were sorry but not enough people have registered complaints on this issue. They would give 25% off the cost of the parts if I order them directly from them. I called back the appliance repair man to get the part number, who said they should be ashamed that these units are having catastrophic failures at 18 months & they should do more. I called Maytag customer service back & the second time "Paula" said they wouldn't do anything for me. There are not enough complaints to warrant a recall. I asked to escalate to the supervisor & was told no. I'd have to write the Executive. EVERYONE needs to do so! Jeff Fettig, 553 Benson Rd. Benton Harbor, MI 49022. They should be ashamed for producing such inferior unit & worse, to not stand behind their product as they claim in their main Tagline! Over the weekend, I realized my washer was spining with a loud hollow/UFO droning sound. I did google and end up in this page. It is the Classic symptoms. It is 18 months old and I don't ahve warranty for it. Since everyone chimes in about the bearing having to be replaced, can someone tell me the part number or where to buy the bearing? Needless to say I am very disappointed with Maytag. After having this machine for about a year the spin cycle started to get really loud. Just about a month ago it started giving me an error code of f11 so I called my extnded service company they came out and told me the computer needed to be replaced and the bearing was going bad (hince the loud spin). They just finished repairing it at a cost of about $600, thank gooness for extended warranty. This thing is a piece of junk and would never recommend maytag to anyone. Why is anyone surprised that bearings fail in these machines? The spiders in these machines are manufactured from aluminium alloys, which are capable of being corroded by almost all laundry aids used, including HE detergent, should the required concentrations be reached. The product of this corrosion is aluminium oxide, the same very hard gritty ‘stuff’ that is the ‘grit’ on the orange coloured sandpaper. Now most of this aluminium oxide will adhere, very strongly, to the spider: A very small percentage will be dissolved in the ‘water’ and some will be carried in suspension in the ‘water’ making a very effective grinding paste. In my opinion the soft lips of the shaft seal stand very little chance once this occurs with the result that the seal fails allowing ‘water’ into the bearings which destroys the bearings in two ways, the normal corrosion of steel in water and the added destructive power of the ‘grit’ abrading the bearings. Bought this Maytag washer in Nov 2009 at Home Depot. Took 8 weeks to get delivered due to shortage in supply. Paid $69.95 for extended 4 yr service plan. Thank goodness we did! Since we bought it it sounds like a jet engine during the spin cycle. It started making clanking sounds recently and got black spots all over my clothes. Repairman came out-rear bearing had went out. Our warranty company said it would be $900 to fix, so they are giving us $649 check to buy new washer. Maytag should fess up and recall these washers-ridiculous! My MHWE300VW was delivered 12/14/2009. I thought perhaps I purchased a Jet Airplane - it is SO LOUD on the spin cycle! This weekend it started giving me the F21 error (won't spin out)yet there is no kink or clog in the drain hose. I have used this unit VERY little & just can't believe that something this expensive would crap out just after a year of limited use! After reading the other posts on here, sounds like I've got a big problem on my hands. I'll be doing some research to see what my options are. After 18 months washer began making horrible noise. Warranty was only 12 months so I called my repair company who said bearing was failing. He said this was more premature than other front loaders he worked on. Most front load bearings have been lasting 6-8 years. For a machine this expensive that is completely unacceptable. The repair was more than the cost of the washer so I now have a broken piece of junk. same issue. after about 1 year the rear bearing had failed. Techs said this will happen again. Seems like an engineering/design failure to me. Maytag covered all parts, they must be losing $$ on this model. Went out less than 1yr.Used very little,senior couple.Repair bill $729.23.Happy it is under warrenty.What about years to come? The spin cycle is very loud. I assume the bearings are bad based on the other comments I'm reading. The machine is two years old. "Maytag" no longer means quality! I had to replace my old Maytag topload washer after I could not get parts to fix it. Whirlpool acquired Maytag and after the acquisition, a number of parts were backordered. So I purchased a MHWE300VW about a year and a half ago. One usually pays a premium price to buy a Maytag as "Maytag" used to mean quality (remember the lonely Maytag repairman), and I paid well over a thousand bucks for this piece of junk. The rear bearing is shot and I have been told by the repairman that the who entire tub assembly needs to be replaced (which would cost almost as much as a new machine). I will never again buy any Maytag or Whirlpool product. We bought this washer about 6 months ago. It has worked flawlessly. After reading about bearing failures for others, I am bit worried, but so far it has been great. We always wash with cold water and they may be helping. I bought this machine for just over $500.00, added the matching crimson dryer for about the same price and got one of the pedestals for free. We saved about $450.00 off the normal price foe both items, plus the free pedestal. Couldn't resist it. If it continues as it works now, I'll be very, very happy! We purchased this washer in November 2009, by August it was making a very loud noise while spinning. We contacted Lowe's and they gave us the service number. The service company kept telling us the part is on back order, this has been going on for 2 months, and still the washer is not fixed and can not be used. Whirlpool has agreed to replace this washer. The exchange process is just as bad as trying to get the part for this washer. It has been a total nightmare. We had this washer for about 6 months before the rear bearing failed. What appears to happen is the rubber seal lets water through and it corrodes the bearing. I could see visible rust and obvious water damage to the bearing. We had it fixed under warranty, but I'm not convinced that the same problem won't cause bearing failure in the next couple months. Needless to say I'm not very happy at this point. We bought our Maytag MHWE300 in January 2010 2 weeks later the washer started to make a lot of noise when on spin cycle. The rear bearing had failed. After much frustration and effort Home depot convinced Maytag to replace the machine. We got a new machine and 2 weeks later the rear bearing failed again. We opted to get the repair guy to just fix it. He changed it and our machine ran properly for a few weeks....now...our machine has failed again. It won't power up. The control box inside the machine has failed. Contacted Home depot and they are in the process of getting us a new machine with a company not related to Maytag.